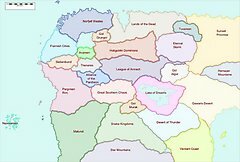 I've worked out a neat effect for displaying different countries and regions in different colors, like you often see it on political maps. 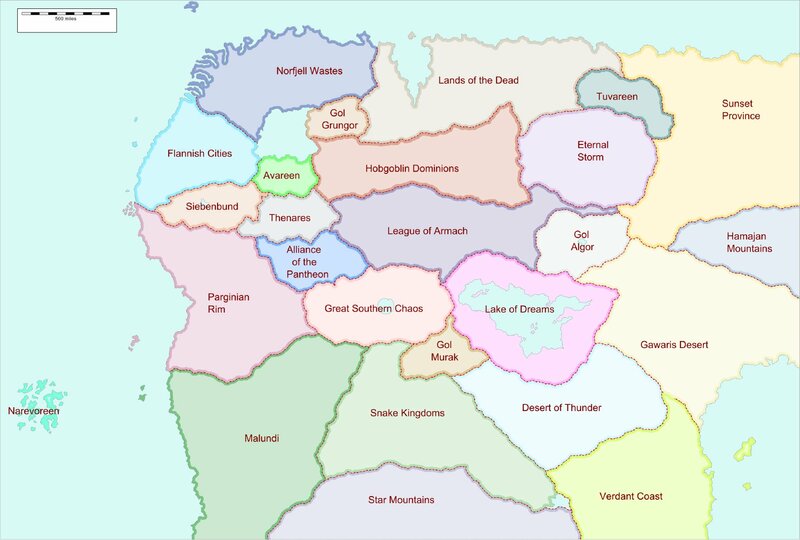 Unfortunately, I forgot the files I used to create the map on another computer, so you will have to create this from my description alone, with the final image (which I attached) as a result. First of all, you need to have some sort of line drawing (created with Inkscape or whatever else you use) that includes (a) all coastlines and major lakes and (b) all political boundaries. For our purposes, these lines must be continuous - so if you normally use some sort of dot or broken line pattern for the boundaries of your nations, switch them to continuous lines and then save them in .png or another bitmap format. Load the bitmap into GIMP. If your bitmap didn't use transparency, convert all the white parts of the line drawing to transparency (with Layer->Transparency->Color to Transparency). Create a new white layer and move it below the other layers. Create a transparent layer named "Color" and move it to the top. Now pick the "magic want" tool with a threshold of 0 and select a single country with it on the line drawing layer. If you have islands or other non-continuous regions that are part of the same country, also select them by pressing the shift key and selecting them as well with the magic wand. Enlarge the selection with Selection->Grow: 1 pixel. Now move to the "Color" layer. Select a color that seems appropriate for the country in question, and use the "bucket fill" tool with the "fill entire selection" option. Now the entire country should be painted in the appropriate color. Repeat the process with all other countries. Select a nice blue tone for the ocean and lake areas, and do the same with them. Now the entire "Color" layer should be filled. However, it is quite likely that the colors now have a very high saturation - which might be problematic if you want to add text later on. Simply change the transparency of the "Color" layer (in the "Layer" dialog) until you are satisfied - I used a Transparency of 30%. Double the "Color" layer and call the new layer "Borders". Switch to it. Use the "Select by Color" tool and set its threshold to 0 - this way, all parts with the same color will be selected and you don't have to fiddle around with the Magic Wand again. Select all oceans and lakes with it and cut them out (with Ctrl-X, although Edit->Cut will do as well). Now select a single country with the tool, and shrink the selection (with Selection->Shrink, appropriately enough) with a width depending on how large you want your borders to be (5 pixels are appropriate for a map with the same resolution as in the attachment). Cut out the rest of the selection. If the country lies next to the border of the map, be sure to switch off the "Shrink from Boders" option when shrinking the selection. If it still shrinks from the border, this means that your selection does not entirely reach it - in this case, you need to grow the selection by one or more pixels first, and then shrink the selection later by the same amount in addition to the "standard shrinkage".